Can you tell me where I can upgrade for free from Player Pro Version 4 to Player Pro Version 5 so I can convert DS2 to DSS files as I still have R26 footpedal. If you have the DSS Player Pro v4 transcription module installed on a Windows PC the free upgrade to v5 is only available using a DSS Player Pro v5 Dictation Module disk. If you work for someone who has purchased a DS-3400 or DS-5000 recorder, the dictation module software is supplied with these recorders. Otherwise you will need to purchase the DSS Player Pro v5 Transcription module seperatly, this is called an AS-5002 and costs $285.00 incl. GST in Australia. The RS26 pedal does work with this software using the latest patches from Olympus which can be found here. I do transcription. I found out on my own on on how to convert the DS2 to DSS. I am using the free Express Scribe software. The problem I have is the sound quality after coverting DS2 to DSS. I slow the speed down to about 60% or 70% to transcribe but it is hard to catch all the words, esp. dates like second or seventh. Any advice? Otherwise my foot will be stopping & rewinding a lot at closer to 100% speed. Can you tell us how you convert .ds2 files? The best option for transcriptionists we have found, if you do not have the latest transcription software from Olympus is to buy the Olympus DSS Pro Dictation module which allows file conversion. This is called AS-5001 and retails for $145 incl. GST and will convert .ds2 to .dss (Windows only) for you – letting you play back in Express Scribe or older Olympus transcription kits. There should be no sound quality issues when converting from .ds2 to .dss, we have only done this using Olympus software but I would expect any software licensed to play .ds2 audio files to convert the audio without loss of quality, assuming they are using higher bit rates. Sorry for not being more clear. I had bought the Olympus DS3400 with the pedal kit from PC Dictate. I downloaded the software to my computer for the transcription portion and the recorder is used by the dictator. When I saw your instructions in the above blog, those were the steps I already use to convert DS2 to dss. As to the sound quality issue, my issue was playing it at a slower rate than at 100% speed. I’ve been trying transcribing at 100% rate and it has been fine. Thanks for your help. I’m a newbie at this. Hi – i’m looking to buy a device that i can use in meetings around a board room table, whiteboarding sessions then have the info auto-transcribed on a mac. Sorry if this sounds simple. What would you recommend as the most cost effective option? You are going to be out of luck using a digital recording and having that transcribed automatically on a Mac. Speech recognition does exists and only a week or so ago a new product was released called MacSpeech Scribe which will take audio from a recorder and transcribe it, single speaker only. There is no software that will transcribe multiple voices for you, you either need to transcribe it yourself or send it to a specialist transcription company like The Transcription People. As for recording your meetings any Olympus note taker from the WS-450S up would be a great option. Also worth a look is the LiveScribe Smartpen which will not only record your meeting audio but will also record your handwritten notes and link those notes to the audio. That does not sound good and is very unusual for Olympus software to crash a computer. I am assuming you are running Windows? ( I have a Macs, they don’t crash 😉 ) Can you let me know what operating system you are running and the exact versions of the dictation module and transcription module you are running. If you could email these to me it will help, I can then respond to you directly and let you have the Olympus voice support phone number for Australia. If you have been emailing olympusvoice.com.au then you will get no reply, they closed down over Christmas and were taken over by Olympus Imaging. I have received some .ds2 audio files via email. How can I convert these to a usable audio format on my Mac? It’s a little ironic and very annoying that an S in DSS stands for “standard” since no standard audio software will play it and since there are so many existing audio “standard” formats, why did Olympus have to complicate it for everyone by making their own? 1. Invest in an Olympus transcription kit (AS-2400 or AS-5000) as they are both Mac compatible and will play .ds2 files, this is the pricey option. 2. Buy yourself the dictation module software (AS-5001) which is a bit cheaper, around AU$150 which will allow you to convert .ds2 files. 3. Chances are the person sending you the .ds2 file is a Windows user, if that is the case their dictation module CD will have 1x windows install licence key and 1x Mac install licence key. Ask them if you can borrow their CD and use their Mac licence key, this will give you option 2 above for $0. I just purchased the DS500 Dictaphone and Transcription Kit. It works like a charm. I have some recorded voice mail messages – .wav files – that I would like to have transcribed – but they won’t download to the DSS Player and I can’t convert them to DS2 or DSS files? Wihtout playing them and recording the voice output with the Dictaphone – how can I load them so I can use the Transcription software and foot pedal to transcribe them? I assume that you are using a Mac. Best way is to convert your .WAV files to .AIFF format which will play in your transcription module. I would look at Max, this is an excellent free audio converter for Mac or some of the great offerings from NCH SwiftSound. Thanks for your New Years Eve comment. Essentially if you receive an Olympus .ds2 audio file you will need up-to-date Olympus software to play it, simply renaming the file extension from .ds2 to .dss will not work. As I have detailed in my post “Options for Playing Olympus .ds2 Audio Files …” there are a number of options available, both at the dictators side and the transcriptionist side. As a transcriptionist you should always have the latest transcription software, it is a necessary expense to enable you to provide your service. I work on MacBook Pro (Mac Os X version 10.6.6) and have Dss Player version 6 installed on it. I work for different clients and only 1 of them has just bought an new DS-2400 digital voice recorder. She makes .ds2 files with it, which I cannot listen to with my version of dss player. I would upgrade this, but I think I cannot hear the older .dss recordings anymore then. As I have more clients working with the older system, this is a problem for me. Is there a solution with which I can listen the .dss files AND the .ds2 files? Sorry for my not so good English, I am from Belgium. Your cheapest option is to upgrade to DSS Player version 7 for Mac – this is available on the DSS Player Pro v5 Dictation Module (AS-5001) disk. This is the software provided with the DS-3400 and DS-5000 digital recorders and will allow you to convert the .ds2 files to .aiff for playback on your Mac using your existing software. Alternatively you can to go the AS-2400 transcription kit which will facilitate the playback of .ds2 and the older .dss files on Mac. Unfortunatly the DS-2400 records only in .ds2 and as it comes with DSS Player Standard you can not can the default record mode (classic mode) unlike on the DS-3400 and DS-5000. I am looking at buying a digital transcription kit that is compatible with my iphone Dictamus app. I think this uses WAV files. Someone suggested the Olympus AS 5000. Would this be compatible? I notice that there are some older versions around which are cheaper however I am not sure what the difference would be? Someone suggested the email functions may not work as well. Thanks for your comment. If the app records in WAV format then yes you could use either the AS-2400 or AS-5000 transcription kits. Both these kits will accept .MP3, .WAV, .DSS and .DS2 audio formats. I would recommend you go with the AS-2400 over the AS-5000 as you will not use the functionality in the AS-5000 kit. I have the manual for both kits in PDF if you would like me to email them to you? How can I convert existing ds2 files to dss? I am not getting my files directly from the client but through a central office at my transcription service. If the .ds2 files are from Olympus you can use either their DSS Player Pro R5 Dictation Module software to convert (also known as AS-5001) or the standard version of their Sonority Software will also convert .ds2 to .dss – Sonority comes free with the higher end notetakers like the DM-450/DM-550,DM-3/DM-5 and LS-3/LS-10/LS-11. Philips will likely have similar software although I am not aware as we no longer sell Philips equipment. I have a Olympus Foot Switch RS28. My wish is to be able to use this foot pedal, nothing fancy. I want to be able to push a button on the pedal and then my audiofile should play/pause. Can i get a program that doesnt cost anything? and where can i find drivers for my foot switch? No is the answer to your question. To use the RS-28 you will need the software driver which is only available with the DSS Player Pro v5 Transcription Module software which is not free. For a very cheap solution you could use the free version of Express Scribe from NCH Software and use keys on the keyboard to control your audio playback rather than pay for another foot pedal. Is it possible to copy DSS Player Pro files from the transcription module (I.e. files sitting in download folder A for example or the Transcription tray) – and then paste to a Dropbox folder. They would then be accessed by a home based typist who would copy the files from Dropbox and paste back in to a DSS transcription module on a laptop for transcribing. Yes for sure. The download folders are actual folders on your computer so you can simply change their location to be a Dropbox shared folder. Dropbox is an excellent platform for securely moving around dictation and transcription. I was originally using an RS26 foot pedal with Olympus Player Pro Release 4 Transcription Module on my old laptop Windows XP. I have now had to purchase a new laptop which uses Windows 7. I have downloaded the Olympus Player Pro Release 4 Transcription Module on to my new laptop. I couldn’t load my RS26 foot pedal as as I understand in Windows 7 doesn’t recognise this foot pedal. I have now purchased the RS28 foot pedal unfortunately I can’t get this as a recognised device either. Please can you help. Thanks for your comment. Ouch ! You will also need the DSS Player Pro R5 transcription module, so the kit would have been a better option for you. The R4 software does not have the RS28 drivers, going to Windows 7 you need to upgrade the pedal and the software. I had the free Express Scribe, and I purchased the upgrade (Pro) because I thought I would be able to play the DS2 files, but it is still not working. I have an RS-27 foot pedal. My doc is going to be using a Philips LFH 9600. Will Express Scribe work if I purchase the AS-5001 or will I have to purchase something specifically designed for the Philips recorder? Thanks! Thanks for your comment. My understanding is that Express Scribe Pro will play .ds2 from all manufacturers – as DSS Pro is a standard the audio should be the same from any recorder. However saying that I do remember some differences between older .dss files recorded on Philips and Olympus recorders. I would check that you have the latest version of Express Scribe Pro (I have seen a couple of updates lately) and if you are are still having issues get onto NCH for comment. AS-5001 is the Olympus Pro Dictation module software, this is the software shipped with the Olympus DS-5000, DS-5000iD and DS-3400 digital dictaphones – the software will not work with Express Scribe – you would be better off looking at the AS-5002 software which is the transcription module and use that instead of Express Scribe. However as you are receiving audio from a Philips recorder you might be better off grabbing the Philips transcription software just to be totally safe. Essentially Express Scribe Pro should be working with your .ds2 files so check for any updates first then grab NCH if still no good. We have two DS-2300 and loved them. We record interviews, select download and it downloads the files in DSS and WAV format. Fantastic as we use WAV to burn to CD for the other party and keep the DSS format for our files. We needed another two records and ended up buying the DS-3400 as we were told the DS-2300 was not longer available and the DS-3400 was the similar model. Now all the files download as DS2 … despite “Classic” format being selected … and we can’t seem to convert files to WAV. Also we keep getting XML files download with every file we download. I have to have two versions of the software on my computer – one for the DS2300 and another for the DS3400. 2 – How can I set it so the download all so it actually downloads DSS and WAV … at the same time. Thanks for your comment. The DS-2300 was replaced by the DS-2400, you were probably advised to go with the DS-3400 as it is not possible to go classic mode with the DS-2400 software – as you are used to the older style formats classic mode makes sense for you. “Now all the files download as DS2 … despite “Classic” format being selected” this sounds like you have set classic mode BUT have not broadcast this to the recorder, this is an essential step. Here is a link to my YouTube video showing how to set classic mode on an Olympus DS-5000 dictaphone. It is exactly the same for the DS-3400, note the broadcast step – the recorder needs to be connected and on during this step. That should fix your problem and you will then get .dss audio files and no more .xml files. Once you have your .dss files you can convert as usual. Even with .ds2 files your software that came with your DS-3400 can convert them to .WAV for you. I have a macbook pro, just purchased it. loaded the AS 5000 on it, plugged in foot pedal and i can ff and rew but cannot play, either with the foot pedal or going directly to the loaded program and attempting to play. what am i doing wrong. i cannot work till i figure this out. the program is installed on my desktop mac and it works fine with and without the foot pedal. That sounds like an odd one. I would check the Olympus website first and make sure you have the latest patches for your DSS Player v7 Plus software (there are some new patches for Lion compatiblility) and also re-seat the foot pedal (pull it out and re-plug). If you are still having problems email me direct and I can give you the Olympus AU support number and they can go through some options with you. Receiving audio file .WMA via email as attachment. Would like to know how to put into my folders for transcribing. DSS Player 2400 and Olympus 802 recorder(used in another office). would like specific steps how to do this. Thx. 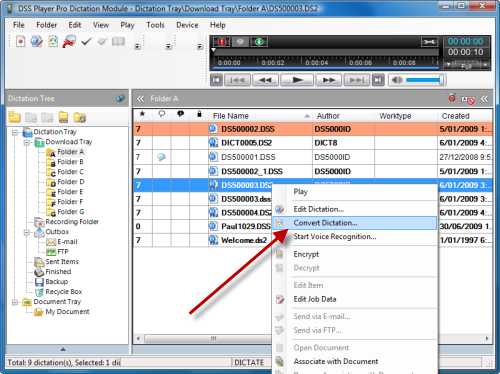 Just drag and drop the audio file from your email (or a saved location) into the transcription module. That’s it! I have the Olympus DSS Player Standard 1.0.3. One of my doctors just got a Philips 9600. The files I am receiving say DPM.DSS. I can transcribe the files but my index marks do not work, among a few other things. Do I need an upgrade? Yes you would need to upgrade to DSS Player Pro v5 or ODMS v6 (transcription modules) to be able to pick up the index marks. 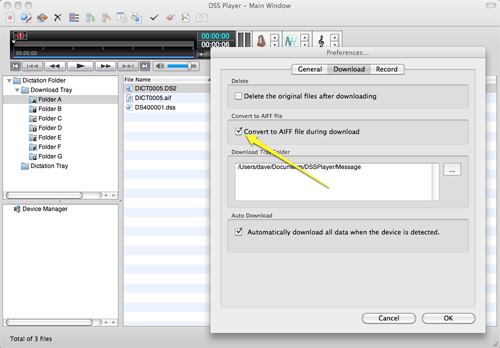 However, I am not 100% on the compatibility of Philips DSS audio files with the Olympus software. Although DSS is a standard it is a standard that not all members strictly adhered to. If you are only receiving files from Philips dictaphones maybe better off with the Philips kit. Thanks for dropping by and leaving your comment. First of all what recorder do you have? All Olympus dictaphones that record in .ds2 audio format come with both Windows and Mac software for audio file playback. The software for Mac and Windows is on the same disk and you will have a licence key for each. The software on Mac is called DSS Player Plus v7 and is currently at version 7.3.2 – If you have misplaced your disk I can certainly get you a downloadable .dmg disk image file for you to install on your Mac – you will need your licence key though to activate the software. I purchased and downloaded the NCH Express Scribe Pro version in hopes that the playback would be good quality, but it has lots of background noise. I am using an Olympus D-40 recorder and when I play it back with the included Version 7 DSS software it plays clear. My problem is there aren’t any hot keys with the Olympus and I don’t own a foot pedal. Should I just purchase an Olympus RS-27 foot pedal, knowing it won’t work with Express Scribe, in case I need to use it in the future with two channel recordings? I am not familiar with the model D-40 but with all Olympus dictaphones you will get the dictation module software, as you have noted this only allows playback and is designed for the person recording to hear their audio and select which files to send for transcription. The low cut filter option on the recorder can be processed by the Olympus software and help improve the audio quality of the recording. This would explain why you hear an audio quality difference between Scribe and DSS Player, Scribe will not process the low cut filter. None of the Olympus foot pedals will work with Scribe, nor will they work with the dictation module software (supplied with the recorder). They will only work with the Olympus transcription module software. Also you will need either the RS-28 pedal or the latest pedal the RS-31. So you will have to struggle on with Scribe or bite the bullet and buy the Olympus transcription kit, either AS-2400 or AS-7000. If you are planning on installing on a Mac then go with the AS-2400. I hope that helps. If not and you have more questions please post them or email me direct. I’ve never been tech/computer savvy. I’ve stuck and been stuck with the basic. I’m a transcriber and I’ve been using Express Scribe for Windows. However, the office I work for is upgrading to Olympus AS-7000 with DS2 files. I was wondering how I could go around this? I’ve read part of the forum above, but I’m still lost (given my lack of savvy!). I am also planning to buy a Mac- I’ve always been a Mac user but had to switch to a PC because I couldn’t get the Mac, or find a Mac program/software that would,to read DSS files. I read above that there is a way, besides installing Parallels on the Mac to be able to run windows. I’m hoping for a simpler way to transcribing DS2 files on a Macbook. Period. LOL. Help please? Thanks! Thanks for dropping by and for your comment. If you plan to use a Mac and transcribe .ds2 or .dss files then you need to get the Olympus DSS Player Plus v7 software. This software comes in both the Olympus AS-7000 and AS-2400 transcription kits, so pick the kit you want based on the foot pedal. The AS-7000 has the RS-31 (4 pedals) and the AS-2400 has the RS-28 (three pedals). That is the only difference between the two kits for Mac users. DSS Player Plus is similar to Scribe so you will get quite familiar with it quick quickly. We have purchased 3 DS5000 systems and are working well but now all the outlook .wav msg files play through the recorder instead of the speakers. How can we fix to play back through the speakers prior to installing the software. Open your dictation module software look under Tools, there will be a “Select Speaker” option. You then have the choice of directing audio through your PC speakers or through the dictaphone. I have the reverse problem and need help. I receive my transcription files in .DSS mode, but I have the new Speech Exec for Mach 1.0.4 and it only reads .DS2. How can I convert the .DSS files to .DS2 without asking the dictator? Thanks for dropping by. Sorry I can’t offer any advice on this one, Speech Exec is a Philips product and we only sell and support the Olympus Audio. Sounds like an odd one though, Olympus are backwards compatible so supported older formats, i’m surprised Philips don’t offer that option. Does Speech Exec take other formats like mp3, wma or wav? If you you could use a converter to go from .dss to one of those perhaps. I have always used Ex Scribe free version no problems. Got a new client who sent DS2 file; so I installed EX Scribe Pro 14 day free trial. Dictation keeps cutting off at the same point. Tried various file converters that I found on the web – nothing fixed. Found Olympus’ free “lite” that allowed me to play audio and hear that dictation was fine (lite has no foot pedal or other controls). After 8-10 hours trying to transcribe the customer’s work, I had to tell them I could not complete it due to the DS2 format – my equipment simply would not work with it. However, I uninstalled the Ex Scribe Pro version and now have lost all use of my foot pedal. Ex Scribe says I have to buy their defective “Pro” version for $40, but seen a lot of web postings that the Pro version is buggy, cuts of sound of DS2 files. Know of anything I can do to get back to where I began (using Ex Scribe Free with foot pedal)? I do not make a lot of money at this and can’t afford to spend hundreds of dollars. The business is simply not plentiful enough here.